During the message that was part of a “Week of Renewal” for a church, Brennan Manning, a Roman Catholic priest st the time, began chastising people whom he described as treating Jesus like some sort of mascot of the church rather than the Pantocrator (Lord Almighty) revealed in Scripture. He bemoaned Christians treating Jesus like a mere art object to hang on the wall or wear around the neck. Manning could drift in his preaching back and forth between focused rage and gentle tenderness. Now I know the importance of taking care of church business and being “real” in the world. Few of us Christians are in danger of seeming unreal to worldly folk or of ignoring the pressures to stay up with the technological trends in the culture. I laugh when I hear Christians say stuff like, “We have to be ‘real’ if we want to relate to the world.” The world is not going to be saved through Christians acting like them. The last thing I need to do is to become more worldly. I’ve been there, and it didn’t work out so well for me. The world will be saved through Christians demonstrating the passionate devotion of Mary Magdalene who didn’t care about the politics of Rome or the latest centurion celebrity or whether the high priest should wear traditional vestments or jeans. She wanted to know one thing, “Where is my Lord?! Where can I find him?! Where can I go to be with my Lord? How can I hear his voice again? How can I experience his love more fully? How can I serve him more truly? Mary doesn’t want applause. She isn’t satisfied with visions of angels. She doesn’t want to promote a book or podcast. She doesn’t even want a multi-site church. She wants her Lord and Savior. Mary Magdalene had followed Jesus to the cross and watched from a distance, as he painfully died. She then followed those who took his body and placed it in the tomb. She “saw where he was laid.” She didn’t want to let Jesus out of her sight. After the resurrection, two angels appeared to Mary and spoke with her. She doesn’t care. Even when she thinks Jesus is dead, she just wants him. This is her second trip to the empty tomb. The first visit occurred when the “sun had risen.” She was desperate to be near her Lord. When she saw the empty tomb, John tells us that she ran and got Peter and John. They ran back to the tomb and looked around. Peter and John walked away wondering what had happened. Mary stayed at the tomb in her desperation. 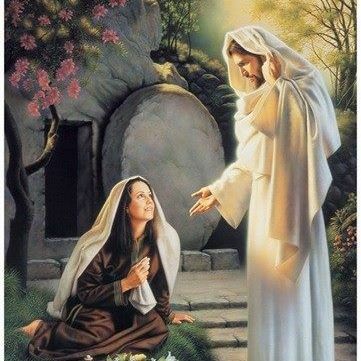 When Jesus appeared unrecognized by her, she, thinking he is the gardener, demands, “Sir, if you have carried him away, tell me where you have laid him, and I will take him away.” Mary Magdalene is telling the resurrected Jesus (unrecognized) that if somebody doesn’t tell her where the body of Jesus is laid, she is likely to become hysterical. She has had it. She wants Jesus. At this point, you could tempt Mary with anything—riches, a mega-church, her own tv show, a million shades of grey, an empire, etc. She doesn’t care. She wants Jesus! She gets Jesus seconds later when Jesus speaks her name. Mary must have been looking away from Jesus. Perhaps, she was frantically scanning the landscape searching for signs of Jesus’ body. “Mary,” he says. She turned to him, and she must have lunged toward him and hugged him or fell at his feet and held him. Do you recognize the Good Shepherd’s voice when he speaks your name? In the midst of your anxieties, fears, work, amusements, do you hear his voice and your name? Do you hear but think it is your imagination, that it can’t be Jesus calling you? Are you too busy or too distracted, even with appropriate activities, to hear and turn toward his voice? It would be normal if this is the case. It only means you are like most humans. Rather than dismiss Mary Magdalene as extraordinary and, therefore, outside the scope of our vision or God’s expectations for us, I think it is better to accept Mary as an exemplar disciple of our Lord. He calls us into both a similar intimacy with him and an extraordinary devotion to him. If we are to follow Jesus, this is where he leads us. We can think of Mary Magdalene as the former demoniac from whom Jesus exorcised a gang of evil spirits and ascribe her devotion to her new-found freedom. I would recommend that we let this reality of her deliverance inspire our own self-examination and plea for deliverance from our own demons that oppress and harass us daily. We may not be possessed but we are harassed and need deliverance from those who harass. We likewise need deliverance from those worldly attachments that hinder our intimacy with the Lord. Mary’s life was simple. She followed Jesus. Her attachments to the world had dissolved in the light of Jesus’ face. May those attachments we have that are outside of Christ likewise dissolve and drift away. Jesus has done nothing less astonishing for us than he did for Mary Magdalene; we deceive ourselves if we think otherwise. Mary M.’s singular devotion to Jesus reminds me of the beloved woman’s passion for her lover in the Song of Songs. Song of Songs offers a poetic narrative of a lover identified as Solomon and his beloved. Through the ages, this relationship has been interpreted as a picture of a godly marriage, a description of God’s love for Israel and an illustration of Jesus’ love for each and every person and his desire for them to requite his love with earnest devotion. At whatever level we interpret the Song, the beloved demonstrates a passion that Christians would do well to emulate in our relationship to Jesus. Likewise, the lover (the man) demonstrates an unconditional love and delight in his beloved that mirror’s the unconditional love God the Father, the Son and the Holy Spirit demonstrate for each of us. The opening lines of the Song (1:1-4) emphasize the romantic love consummated between the two through their physical union. Scripturally, we know that a godly marriage between a man and a woman points to the relationship between Jesus Christ, the bridegroom, and his bride the church. (Ephesian 5:31-32; Revelation 19:7-8) The beloved says, “The king has brought me into his chambers.” The King of kings Jesus Christ has called and wooed each of us with his love to come and relate to him intimately. He has brought us into the chamber of his throne room to reign with him. Listen to the loving words of the lover (man) to his beloved (woman,) “Behold, you are beautiful, my love; behold, you are beautiful.” (1:15) She responds, “Behold, you are beautiful, my beloved, truly delightful.” 1:16) This demonstrates a romantic love for each other, but it also represents the unconditional love of the Good Shepherd for his flock. We often speak of God’s love for us in Jesus Christ, but what about our passionate and unconditional love for Jesus—our bridegroom. Mary Magdalene lived a passionate, robust love for Jesus that declared to him, “You are beautiful, my beloved!” As Christians, who are saved, we must stop waiting for our love for God to spring up automatically amidst the distractions of the world and the dissipation of our lives. We need to proactively develop and nurture a love for Jesus. We can do this by declaring his beauty and our love for him, as he does for us. This is more than spousal love; this is the love of the saved for his or her Savior who is perfect in every way. Not wanting to put words in Jesus’ mouth, I think this sounds like his voice wooing his bride—each member of the church, even each person for whom he died. This is how he calls us. Through Jesus Christ, the winter of sin and death is passed for us, as we have passed from death to life, from darkness to light, from captivity to freedom, from exiled to embraced. In the silence of his loving presence, if we are quiet and listen, we can hear Jesus saying, “Let me see your face, let me hear your voice, for your voice is sweet, and your face is lovely.” Is it possible that your voice is sweet and your face is lovely to Jesus? Mary Magdalene, from whom Jesus cast out demons, came to believe and know this truth—that she was lovely and beloved to Jesus, and she clung with all her spirit, soul and strength to this lover of her soul. She would not let any “little foxes” spoil the blossom of her spiritual intimacy with Jesus. No distractions, no temptations of sin, no returning demon would she allow to interfere with her devotion to her Lord. Listen to the desperation of the beloved woman for her lover when he is not in her arms, “I will seek him whom my soul loves…When I found him whom my soul loves. I held him, and would not let him go.” (3:2,4) The beloved woman adjures her lover, “Set me as a seal upon your heart, as a seal upon your arm.” The Lord’s heart is sealed with love for you and upon his arm is your name. With a glance of your eye toward him, you have captivated his heart and bound him to you forever. (4:9) To those who overcome the world in steadfast faith, he will seal them with his name and kingdom. (Revelation 3:12) This sealing and binding is the new covenant in Christ’s blood and the eternal marriage between the bridegroom and his bride that will never be disjoined. God will not divorce his bride in Christ.